The botanical name for garlic is Allium sativum, and it is a vegetable that belongs to the same class as onions, leeks and chives. It has been used for centuries for flavoring food and as folk medicine by the Egyptians, Greeks and Romans. Garlic is a healing botanical that has been scientifically proven to lower blood pressure and the levels of the bad LDL cholesterol as well as total cholesterol. Garlic contains numerous nutrients like calcium, potassium and selenium as well as vitamins B6, B1 and C. It also packed with other phytonutrients that make it an integral component of the Candida Diet. A study found that garlic has antifungal activity against Candida albicans (1). This antifungal property of garlic has been attributed to a compound known as allicin (diallylthiosulfinate) which is formed when garlic is crushed and a substance known as alliin reacts with an enzyme known as alliinase (2). Allicin has also been shown to work synergistically with some anti-fungal medications against Candida (3). Garlic contains vitamins B6, C and selenium which are suspected to have immune boosting properties. A study also found that garlic enhanced the function of the immune system and reduced the severity of cold and flu symptoms (4). 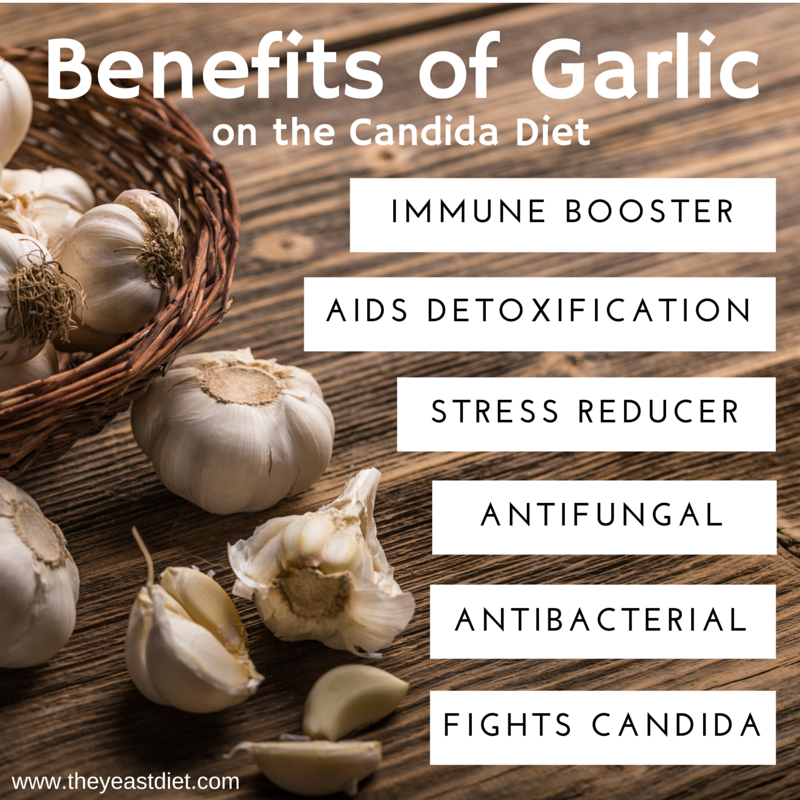 The combination of its immune boosting function with its antifungal properties make garlic a great choice for preventing Candida colonization. This is especially important for persons with poor immune systems like those receiving chemotherapy for cancer since they are at a greater risk of developing Candida overgrowth. A study proved that the ability of Candida to stick to the cells lining the mouth was reduced after they were exposed to garlic extract (5). This is beneficial for reducing the Candida overgrowth that develops as a result of consuming excessive amounts of fermented foods. Feeling tired and worn down are symptoms associated with Candida overgrowth. Garlic can help relieve these symptoms since it has been used for centuries as an anti-fatigue agent. Studies have also confirmed that it can reduce physical fatigue in humans (6). A study also found that garlic extracts had antibacterial activity against Escherichia coli (E. coli), Bacillus subtilis, Staphylococcus aureus and other bacteria (1). Infection with E. coli often leads to gut infections that necessitate the need for using antibiotics that destroy the good gut bacteria and lead to Candida overgrowth. Consuming garlic can therefore keep the population of bad gut bacteria like E. coli in check and reduce the need for taking antibiotics. Garlic has been shown to have positive effects on detoxifying liver enzyme and reduce the effects of toxins (7). These detoxifying properties make it useful for helping the body maintain a balanced state that can prevent Candida colonization. Garlic contains antioxidants (8) which mop up the free radicals that are produced in large amounts when the body is under stress. By reducing the hazardous effects of stress on the body, garlic can help reduce the Candida colonization that develops due to stress. To reap these Candida healing benefits, it is best to consume fresh garlic since allicin disappears during processing (9). The recommended dose for yeast infections is 2 cloves per day after crushing them with a knife, mashing or mincing them (10). In addition, ensure that you combine taking garlic with another natural antifungal to prevent the Candida from adapting to it. Perfect examples include herbs with proven antifungal properties like cumin (11) and oregano (12). Sage, cinnamon and cloves are other good options. For additional recipes that incorporate garlic into a healthy yeast free diet check out the Candida Diet Cookbook with 250 recipes, snacks and tips to help you fight Candida with every delicious meal. Find the cookbook here. Garlic is famous for its strong odor which causes garlic breath. To reduce the chances of developing this halitosis, consume it together with parsley and fennel. 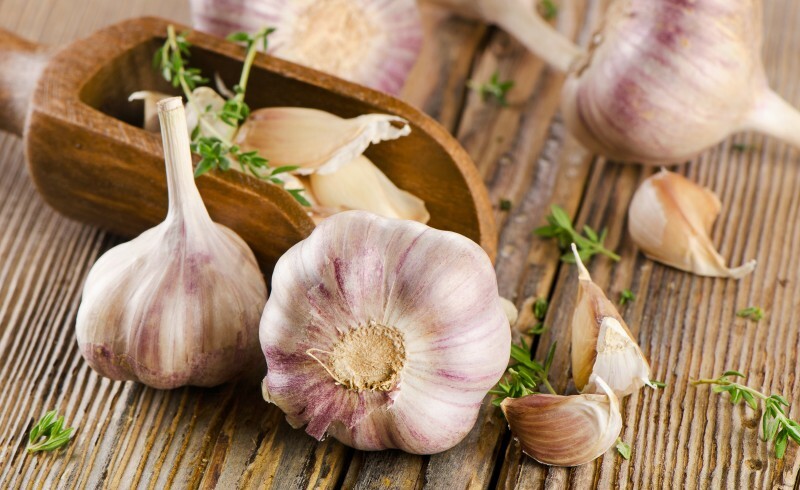 Garlic also prevents blood from clotting and this can be dangerous for persons taking blood-thinning medications like warfarin (Coumadin), clopidogrel (Plavix) and aspirin. Persons on these drugs as well as those with bleeding disorders like hemophilia should therefore consume it after consulting their doctors. Whitney Frazier has spent more than 10 years helping thousands of people all over the world find better health with her deliciously simple recipes for use on the Candida Diet. She regularly posts articles, topics and recipes on yeast free living and personally answers questions on the Candida Diet Facebook Page. Nicely researched article, Whitney. The only thing I would personally recommend is being careful of the source of the garlic. Stay away from Garlic imported from China. In fact, stay away from any foods imported from China and Viet Nam, especially fish. Chinese Garlic is treated heavily with pesticides. And 30% or more of garlic consumed in the US comes from China. Whitney, Thank You for the amazing cook books. My son has a severe allergy to yeast and making the same meals over and over was getting boring. Just looking through the cookbooks I know he will be truly happy with some of these amazing meals. There are so many wonderful recipes and step by step makes it so easy!!! 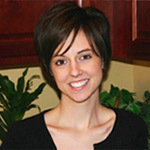 Whitney Frazier is the author of the Candida Diet Cookbook and Meal Planning program and is an expert on the Candida Diet. She has spent more than 10 years helping thousands of people all over the world find better health with her deliciously simple recipes for use on the Candida Diet. She regularly posts articles, topics and recipes on yeast free living and personally answers questions on the Candida Diet facebook page. Disclaimer : The views and information contained on this website is for informational purposes only. If you are experiencing any of the symptoms mentioned in this site you should consult your medical professional who can advise you on your specific situation and recommend a treatment for you. This site is in no way intended to be used in place of medical advice from a licensed professional. The guidelines set forth on this site are maintained through personal research and experience and in no way guarantee similar results. Individual results will vary.